Right now the world of online marketing is going through a major transition. More and more companies are focusing their efforts on content marketing to reach their audience on relevant blogs whilst also acquiring backlinks to their site in the process. As businesses and agencies alike realise the convergence between SEO, social media and content marketing – bloggers have a new opportunity to monetize their web sites, increase the value of their content and provide a fresh voice on their site. PostJoint is a new platform where advertisers and bloggers meet. Its a service for bloggers to access fresh content for their sites, make new relationships with advertisers, and earn some money in the process. 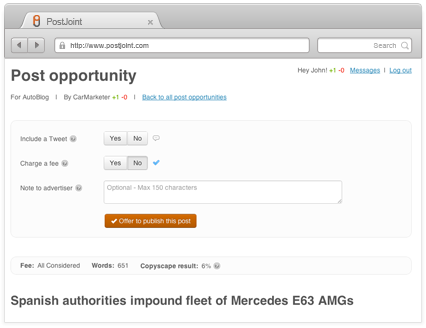 Bloggers can get paid to publish posts from PostJoint’s advertisers (who are independent) at a rate of $25 to $500 per post. Right now the system is in Beta and is free for everyone to use. PostJoint recently announced that their bloggers have already earned over $100,000 in just a short amount of time! Let’s look at some screen grabs to better understand how the site works. When you login the first thing you see is the blogger dashboard. From here you can see the “Offers You’ve Made” and “Opportunities” section. Opportunities are prewritten blog posts that you can offer to publish. They are targeted to your interests and your blog so that you can ensure relevance. As soon as an opportunity receives five offers it disappears so you need to be quick when you see a post that you like. When you create your blogger account you will need to choose some content categories to determine the opportunities you receive. The more you select the better (you can choose a maximum of ten). Once you find an opportunity that you like, you click on it to view more details like a snippet of the post, outbound links and copyscape score. The opportunities are either marked as “free”, “paid” ($25-$500) and “all considered” which means you can make any offer. 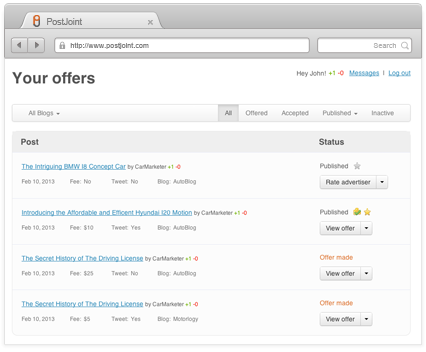 Below you will see a screenshot of the area where you can fill out your offer information. 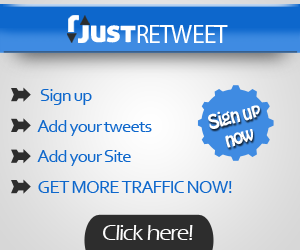 You also have the option to include a tweet, which is a big benefit for the advertiser. You can also state your requested fee and add a note to the advertiser. An important point to note is that advertisers can only get a maximum of five offers per post, meaning you always have a decent chance of being accepted instead of competing with hundreds of others. The offers area allows you keep track of all the offers you have made, grab the full article to post on your site when your offers are accepted, check payment stats and provide feedback to advertisers. In summary this is a very promising system where you can make money, get fresh content and develop new relationships with advertisers. Go ahead and get your free account now before they start charging! Looks like a promising new method. I will be signing up for PostJoint now. In my views PostJoint seems to be as a completely unique site of its type. I hope it proves beneficial to me! Thanks for writing about it Chris! I have been using PostJoint for couple of weeks and I would say that it’s one of the best websites, not only they provide you with guest posts but you have also the chance to earn money to publish this post, PostJoint provides the best environment for bloggers and authors to meet without paying anything for the website itself. Thanks for sharing this post. 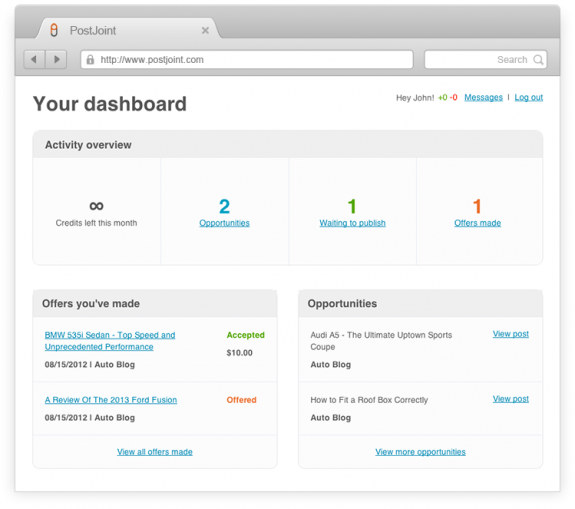 I have recently written a review about PostJoint on my blog too. I had a positive experience with this platform and I’ll continue using it. Sorry to be a naysayer, but I’ve been in PostJoint for a while and I just can’t get on with it. I’m seeing very few opportunities, and most have not been of interest to me. I’m also put off by the fact that you don’t get to see the whole article until you’ve offered to publish it. In addition, on the odd occasion I have offered to publish something, my offer has usually been rejected. Consequently, I’ve more or less given up on it. I’ve had much better experiences with another, similar service, MyBlogGuest. I’ve sourced some excellent posts for my blog from this, and overall I find it works much better (for me anyway). I see this article was post a little while ago. I wanted to know if anyone has tried PostJoint and if they have made any money off it yet? Please let me know. I have not only made over $1800 on the blogger side, I have been able to get content published on really strong blogs using the advertiser side. 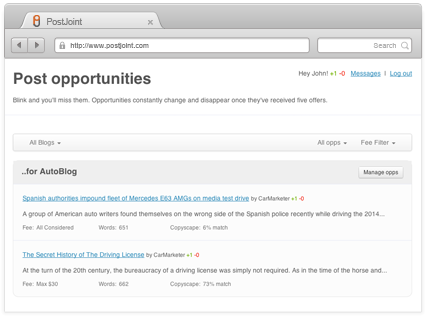 I highly recommend PostJoint to every blogger and agency. It is far easier to learn and use than any of the alternatives. Anyone can be publishing or placing content with almost no learning curve. Definitely my favorite blog outreach platform and second favorite method of making money on a blog (after paid advertising).